Order LED display signs, light boxes and boards today. Our LED store offers you the same great values and unsurpassed customer service you have grown accustomed to with Anything Display. Adding an LED sign, LED Light Box, or LED accent Lighting is your chance to win new business. Ever been in a strange town? Remember when you were new in town? A good sign gets noticed. 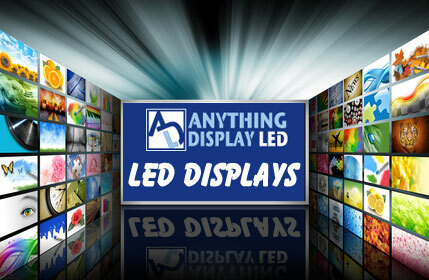 Colorful lighting attracts attention, LED Light Boxes showcase your products and services with bright, vibrant graphics. The first day I had my LED sign up a customer said to me, "I've driven by this place hundreds of times and never knew you were here". How much business drives right by you every day? Have you ever considered, without having an LED advertising display sign, how many potential customers could pass through town without ever knowing the products and services you offer? That's why we offer a unique and impressive way to let people know about your business! We provide Church LED Signs, Indoor LED Signs, Outdoor LED Signs, Open LED Signs, Window LED Signs, and Message Centers. "I love the idea of getting an LED sign but they're so expensive". Not anymore! The cost of LED signs has dropped dramatically over the last few years; usually less expensive than a traditional lighted sign, certainly much lower on electric bills then traditional lighted signs. You're going to quickly see increased business activity. With an LED sign you will get noticed! An LED sign adds credibility to your business; it makes new customers feel comfortable and confident about your business. The easiest way to win new business is to let people know you're there and tell them what you have to offer. "It's the best advertising we've ever done!" An LED sign is by far the fastest and easiest way to attract attention to your business. What's more important is the quality of LED units. Lower on electric bills then traditional lighted signs; brighter and crisper in daylight; animated messages and now full color movie quality displays exist. With an LED you can change your advertising, show specials and prices, thank community volunteers, efficiently market your products and services, and, more importantly, save money at the same time.